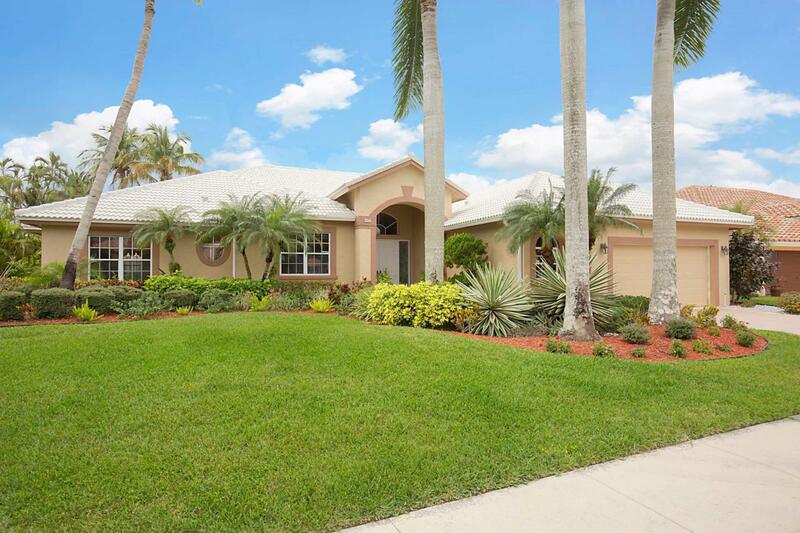 Enjoy the sunshine and beautiful light that flows into this spacious pool home situated on a beautiful .34 acre lake lot. Located in the most desirable village in Aberdeen, this special property features a new roof (2015), spacious Master Suite w/luxurious bathroom, extra wide 2 car garage w.storage, open pool w/covered porch and expanded patio. The open kitchen has white cabinets, stainless steel dishwasher & refrigerator, expansive counter space & snack bar overlooking the family room and cozy breakfast area. Open living/dining room w/custom bar is ideal for parties and entertaining. Pretty powder room w/pedestal sink. Interior laundry room w/new LG washer/dryer, + sink and storage cabinets. Membership to Aberdeen CC is mandatory. All ages welcome. Pet friendly. Rentals OK.ANSWERS TO FREQUENTLY ASKED QUESTIONS + Things You Should Know: *Water heater 2008 *Roof 2015 * 2 Zone AC. * Split Bedroom plan - Master on one side and 2nd, 3rd & 4th bedrooms on other side. * Master Suite has tray ceiling, 2 sliders out to pool/patio, walk-in closet plus large wall closet. Bathroom has oval soaking tub, separate vanities + shower w/seat. * New berber carpet in 2 bedrooms. * 4th bedroom/den has custom built-ins. * Guest bathroom shared by den & 2nd bedroom has 2 sinks + combo tub/shower. * 3rd bedroom has ensuite bathroom with Cabana Entry/Exit to pool. * Monthly HOA fee $300 covers cable, common areas, community pool and manned gatehouse. Each Homeowner takes care of their own lawn & landscaping. * Pets are welcome. * NO motorcycles, campers, motor homes, boats etc. allowed * Rentals are allowed immediately after purchase, however, only one time per year with minimum 3 month term. * Association Approval is required for Muirhead Estates. Costs associated with Application are: $150 application fee, $200 Gatehouse Security Fee, $29 per each adult applicant ($100 for Canadian Background check) plus $65 bank check or money order to Campbell Property Management. * Country Club membership is MANDATORY. All memberships available w/many different options. Newly renovated clubhouse is turning heads throughout the community and around town! Beautiful Bar/Lounge/Restaurant with outside seating overlooking the lake. There's golf, tennis and pickleball too!